We think you will be interested that 2017 is the 30th year since the founding of March 1st as Women of Color Day, the only day in the year when women of color are specifically honored. 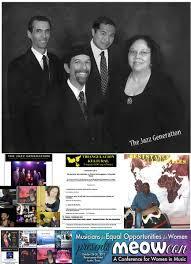 The day was established by the National Institute for Women of Color (NIWC) on whose board I served for 11 years. During those years, at the suggestion of Pat Williams, faculty of Ohio State University, in addition to holding national women of color conferences in Washington, DC, Reno (NV), and Harrisburg (PA), we began the commemoration of March 1st, as Women of Color Day. Unfortunately, NIWC became inactive in the 1980's. At that point, rather than let the effort die, I established the International Association for Women of Color Day, to keep this movement alive, honoring outstanding women of color with a special award only for them, but also adding the Aurora Award to honor those women, men, organizations and businesses of any ethnic group that supports women of color and/or also supports justice and equality. IAWOCD has promoted Women of Color Day across the nation and internationally. To date, it has been commemorated in 25 states and 5 other countries. A Women of Color Day ceremony has been developed as have logo products to support this work. Additional support has come from advertisers in the souvenir program booklets of the annual events collaborated by our office/headquarters in Sacramento, CA. I have personally underwritten any shortfall through the last 17 years. In 2016, I wrote The Constructive Extermination of Women of Color: Consequences of Perpetual Socio-Economic Marginalization to document and publicize the horrific circumstances facing the overwhelming majority of grassroots/working class women of color. The book was based on my unpublished dissertation, Racism and Sexism in Higher Education: The Autoethnography of an Activist and 18 "Women of Color" columns written between 2008-2011 in the online publication, blackcommentator.com. Printed by Sacramento Library's I Street Press, copies of the book are available in the Queens Library and Langston Hughes collections in Queens, NY, as well as in the general collections of Sacramento and Yolo County collections in California. Additional information is available online at https://womenworldculture.com/women/8-women/5-international-association-for-women-of-color-day and http:www.womenofcolorday.com. Purchases of greeting cards, books, logo products and CDs as well as speakers are available at these sites. A review of the book, "The Constructive Extermination of Women of Color: Consequences . . ." and discussion of the work on behalf of women of color, other oppressed populations and an array of civil/human rights work are addressed in the review, "Writing Against Wrongs," in the Sacramento News and Review." FYI, Kwanzaa is 50, Earth Day is 46. There were many years before each of these days achieved their current recognition. Considering the impact that racism plus sexism, which is only experienced by women of color, has had for centuries and throughout the history of the U.S. We are proud that Women of Color Day is entering its 30th year. To commemorate this important occasion, the official Women of Color Day greeting card series has been developed. 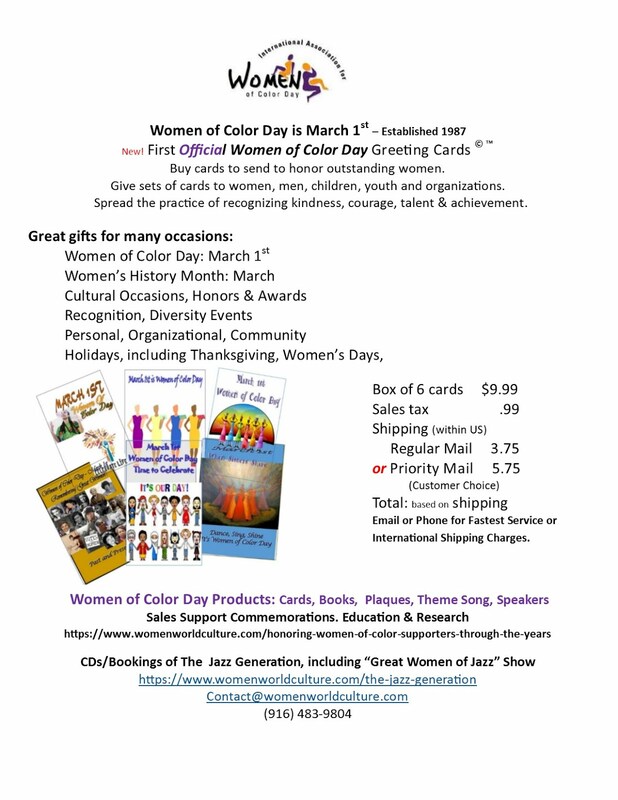 A flyer about these cards with a brief overview of Women of Color Day is attached along with other examples of commemorations outside of Sacramento. If possible, it would be appreciated if you could make those attending aware of Women of Color Day and encourage their support of it. Women of Color Day is an opportunity to expand recognition of outstanding women of color and other outstanding women, men, organizations and businesses, especially at local levels where the need for such attention is the greatest and yet the least often extended to the masses of great people among our midsts. The importance of bringing attention to those we honor,whose work and arts we make known and the education that takes place on a widening scale was made very clear in the elections that have taken place in the past several decades. Despite considerable efforts on behalf of women of color and specifically the issue of racism plus sexism, the mere mention of these words was refused by the Republican Party, Democratic Party, Hillary Clinton Campaign, Bernie Sanders Campaign, Jill Sanders Campaign, and Green Party. In the face of the fact that women of color vote at the highest rates of all groups, this across the board rejection cannot be ignored. There are many great efforts underway which we support. Our part of this effort is to bring about wide recognition of the education, skills, talents, creativity, experience, insights, community service, grassroots/working class efforts and achievements to facilitate the inclusion of those working for justice and equality for all. Too many great people are unknown, including to each other. Too many grassroots/working class people give all of their resources for these just causes, only to be excluded, demeaned, kept from earning a decent living despite high qualifications as cronies, friends and family of those who refuse to recognise us or include us are hired or appointed, sometimes because they look like us, although in fact they are representing themselves and not the masses of us. We all need each other working in coalition if we are to truly succeed and become free in our lifetimes.